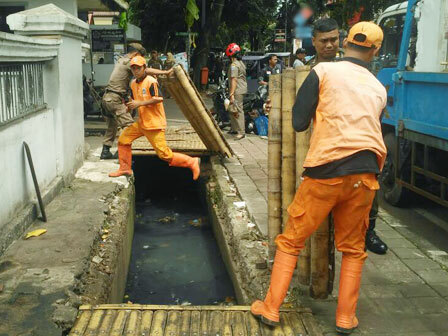 Around 14 manhole covers of the water channel on Jalan Cempaka Putih Tengah 13, Cempaka Putih Timur Urban Village, Cempaka Putih, Central Jakarta were demolished by joint personnel of Satpol PP, Transportation Sub-dept., PPSU, army and police. It was done to smoothen channel cleaning and avoid PKL.
" We have demolished manhole covers used by the PKL today. We do this to smoothen water flow and prevent the PKL"
"We have demolished manhole covers used by the PKL today. We do this to smoothen water flow and prevent the PKL," expressed Sri Hatmo, Head of Cempaka Putih Timur Urban Village, Wednesday (3/21). According to her, the raid was focused on the misuse of public and social facilities. Aside that, her side also controlled two billboards, one illegal building, carts, three bajajs, two public minivans and five motorcycles due to illegal parking. "The raid runs conducive, and we hope it can give deterrent effect," he said.